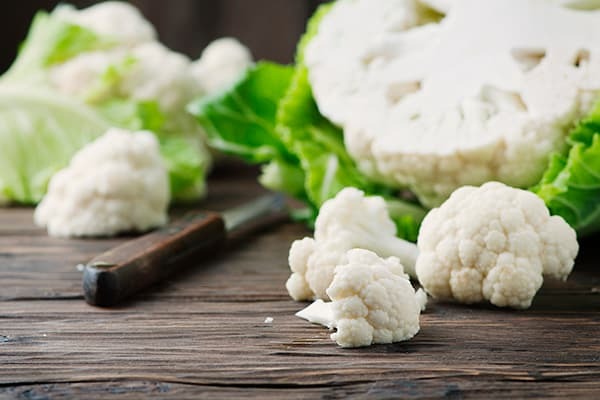 After playing second-fiddle to its more popular cruciferous compatriots, this workhorse of the vegetable world is finally having a moment in the sun. Nowadays, it’s hard to find a recipe that doesn’t use cauliflower — cauliflower bread, cauliflower fried rice, cauliflower buffalo bites — the possibilities are endless. Now you can add Cheesy Cauliflower Garlic Breadsticks to the list. This exclusive FIXATE recipe from Autumn and Bobby Calabrese is a perfect side dish, after-school snack, or party hors d’oeuvre. “I have to admit, I have a weakness for cheesy, buttery garlic bread,” says Bobby. “Sadly, it’s definitely not a Fix-friendly food. But after the success we had with the broccoli crust pizza, it made me realize I could probably pull off a FIXATE version of breadsticks too.” And boy, did he. The bread is actually made out of cauliflower that’s been “riced” (more on that in a sec), mozzarella cheese, Parmesan cheese, and eggs. That’s it. You can also buy riced cauliflower at most major supermarket chains if you’re in a rush. As an admitted picky eater and former member of the “No Vegetables, Ever” Club, these breadsticks are the bomb. From the chef himself: “All I have to say about this is you have to try it; you’re not going to believe you can get your veggies this way! Buttery, cheesy, garlicky, and once again you get “bread” without all the hours of kneading and rising! That’s a full-on win in my book.” Ours too!